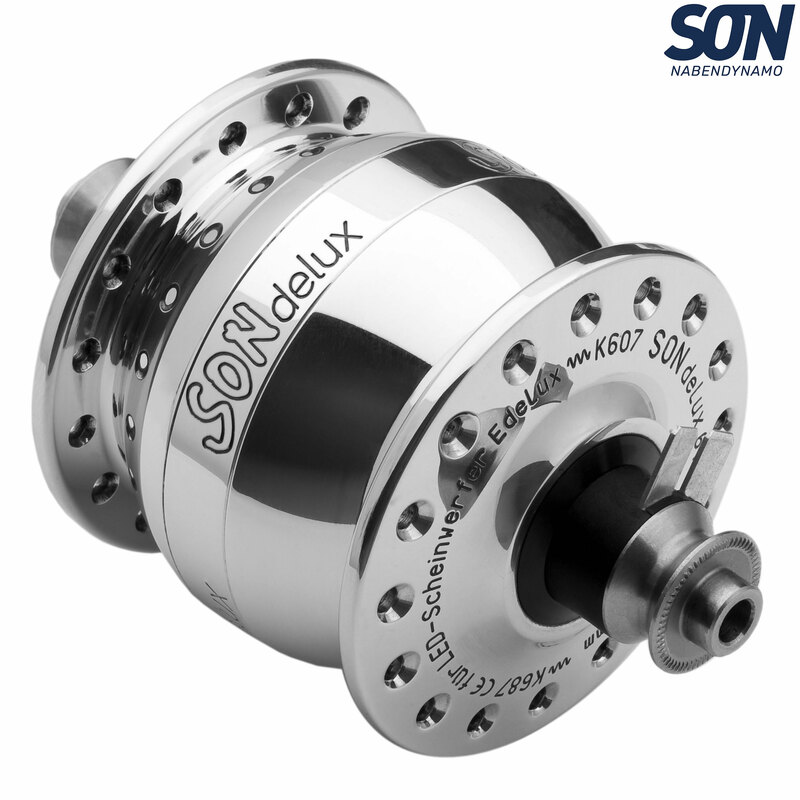 The SONdelux is the first hub dynamo generator specially designed to match with the requirements of modern LED headlights. SONdelux has received the German legal mark of conformity to be used together with the Edelux in all wheels of sizes from 16“ up to 700c. SONdelux replaces the SON 20R, which is almost identical in construction. SON 20R had the legal conformity for 16" upto 20“ wheels only. So now for nearly all applications SONdelux & Edelux are the ideal dynamo powered lighting system providing maximum illuminance at minimal physical effort. The SONdelux works fine with other high-end LED-headlights, such as the Lumotec IQ Cyo by Busch & Müller, however without legal conformity in Germany. The model for disc brakes has a centerlock mount. The SONdelux is as robust as the SON 28 with the same high-quality finish. It is much smaller in size and more light weight (390g). So it is attractive even for elegant road bikes. We have the SON delux fitted to two bikes, used by my wife and I on a daily basis. The 20" wheels were built in 2012 so have been through 3 winters with no problems so far. As these are city bikes we leave the lights running full time to give added visibility. I can occasionally notice a slight vibration in my handlebars at speeds of approx 15 to 18 km/hr, but this does not detract from their use. Overall, we are very satisfied. So this was my first foray into the world of dynamo lights. The Schmidt dynamos are not exactly cheap when compared to other brands, however I had read of people using Schmidt dynamos for upwards of 10 years without fault, so I considered this a good option. I was worried about the stiffness of the rolling resistance on the hub, but once up and running you really do not notice it, even with the lights on. Having only recenlty bought new wheels, I opted to rebuild my front wheel with the new hub, and my only problem was getting the spokes through the holes because of the way the hub bulges in the centre: an insignificant problem in other words. I would thoroughly recommend this to commuters, or anyone else for that matter, especially if you find yourself regularly riding at night or at northern latitudes where the evenings can catch you out as winter draws in. For those with wireless computers, I have had no problems with interference whatsoever. Would You Be Able To Get The Sl Version Of This Hub? I'm looking for a SONdelux SL in silver. Would you be able to get one, and how much would you sell it for?